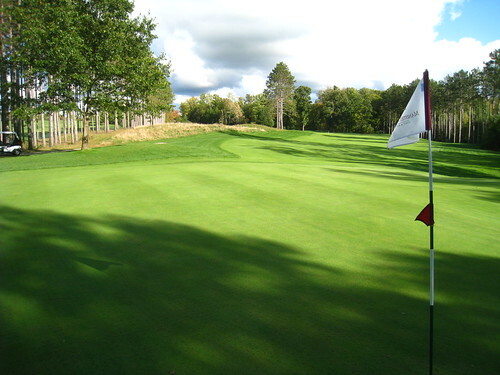 I used to be a member at Manistee National, so I thought it made sense to preface this review with that. In other words, yes I am biased. 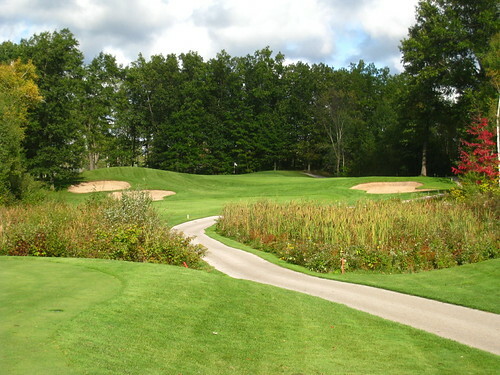 I have played both courses multiple times, and am a huge fan of both. 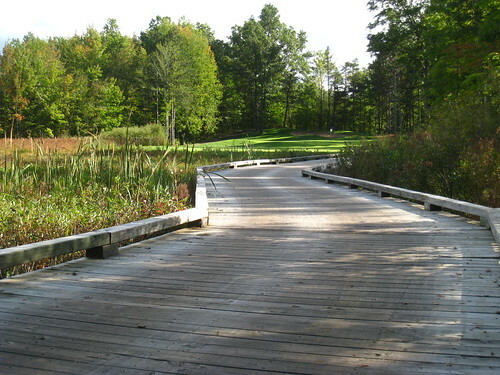 The Canthooke Valley course is more of a traditional track, while the Cutters Ridge course is labeled as more of a resort course. 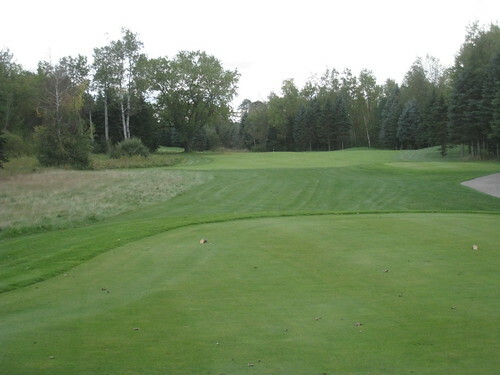 When I think of resort courses I think wide fairways, greens with gentle slopes, not a lot of OB, etc. Basically somewhere the beginner can go, not lose too many golf balls, and still have a good time. Cutters Ridge is not that type of resort golf course. 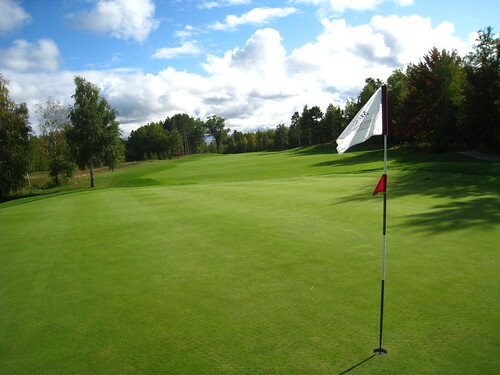 There are a number of forced carries, a few thin fairways and some very challenging greens. 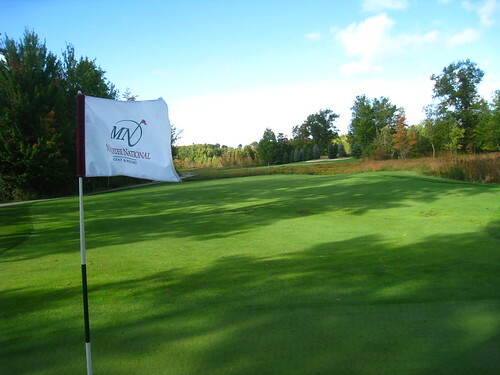 Now that I think about it, I guess Manistee National has something for every type of golfer: Canthooke Valley for the more “fun” round (although it does have its challenges), and Cutters Ridge for the seasoned golfer who wants to be challenged. Even from the Whites, this track is tough. 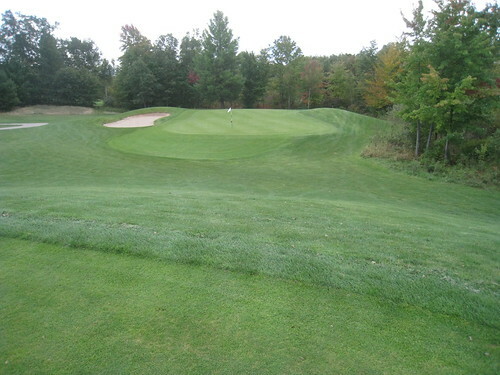 The first hole is a straight-forward par 4, with a little room to bail right off the tee. The approach is a bit tighter, and the right side isn’t an option anymore. There’s a sharp drop-off into the junk as you get closer to the green, and with little room to bail left, a good approach shot is required. 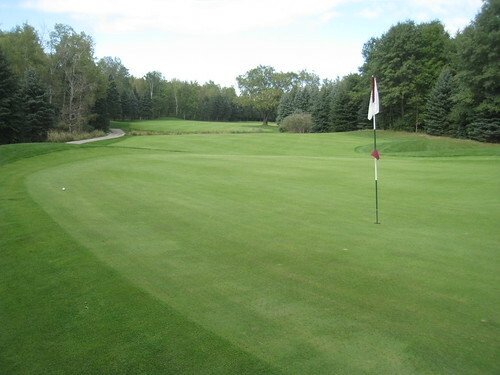 The second is a par three that requires a carry over some junk to a green with lots of undulation. The hole is short (140 from Blues, 127 from Whites), so I hope your wedges are ready to go; you’ll need them! 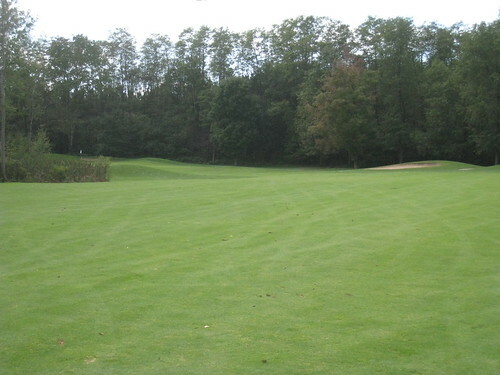 The third is a 391 yard par 4 that doglegs (well, more like “jog-legs”) to the left, but I’d be hesitant using a Driver off the tee as there’s junk in the fairway at about 110-120 yards from the green. 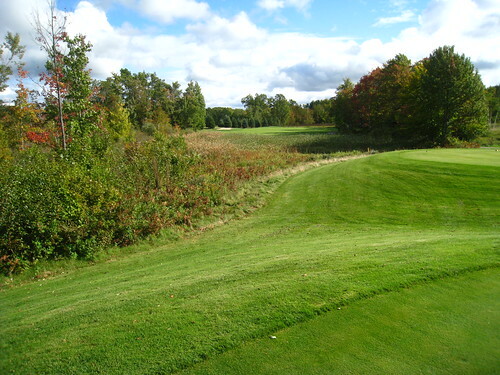 The goal of your tee shot is to hit it far enough so the large tree on the left doesn’t affect your approach in anyway. You can see the 150 marker from the tee, so measure yourself off to that and club accordingly off the tee. Here’s what it looks like from the green looking back. Note the big tree is on the right now. One thing I like about Cutters Ridge is that at times, there is a reasonable distance between green and the next tee. 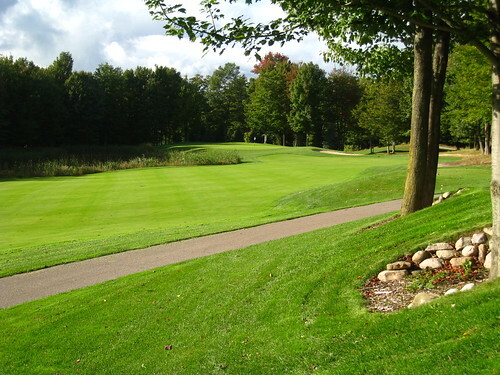 Although detrimental to pace of play for most walkers, it’s nice to feel like you’re “in the woods” when playing golf (especially in Michigan.) It gives me the feeling of solitude and is one of the things I really love about the game. 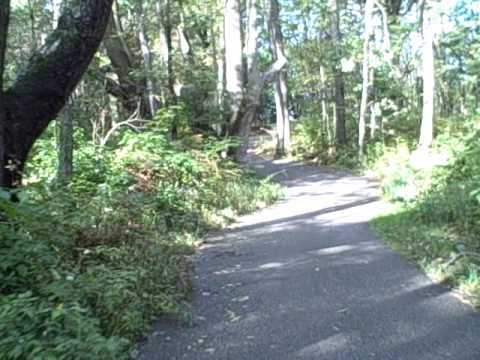 Here’s a quick video of the trail between the 4th green and 5th tee. I think you’ll see what I mean. The 6th is a reachable par 5. You have to hit a strong Driver, and consider either hugging the trees on the right, or clearing them depending on your ball flight. 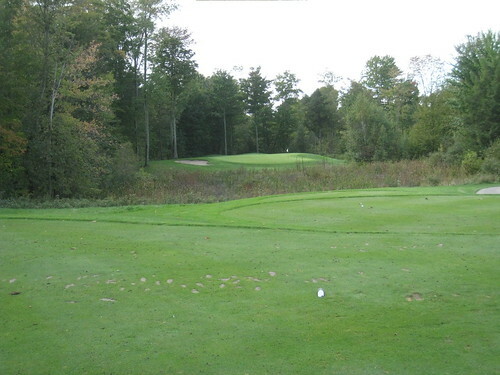 A perfectly struck tee shot might leave you < 200 yards for your approach. 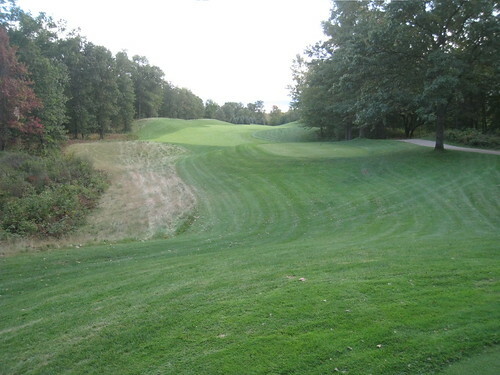 With a good tee shot, this is a definite birdie opportunity. As you’ve seen, it was a pretty cloudy day. When I got on the 6th green all of the planets aligned, and I got one of the best pictures of the day. My dad even noted how great the view was looking back on this hole. Judge for yourself. 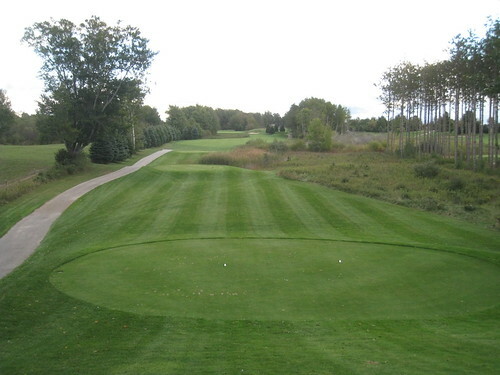 Seven is an interesting par 4 in that it has an island fairway (well, kind of.) 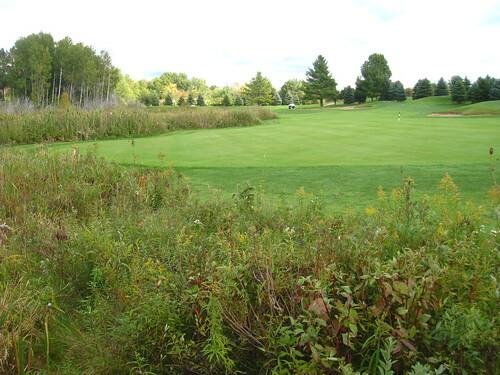 The tee shot requires a carry-over ferns and other trouble, and so does the approach. There is a little room left on this tee shot if you need to bail. The approach also requires a carry, as you can see in this shot from the green looking backwards. Boy, the sun was still cooperating! Eight is a par 3 that in my opinion requires the most precise tee shot. Long is death here, as it slopes down to trouble that you don’t want to have to deal with. It’s 154 from the Blues; if you’re between clubs, make sure you take the lesser stick just in case. 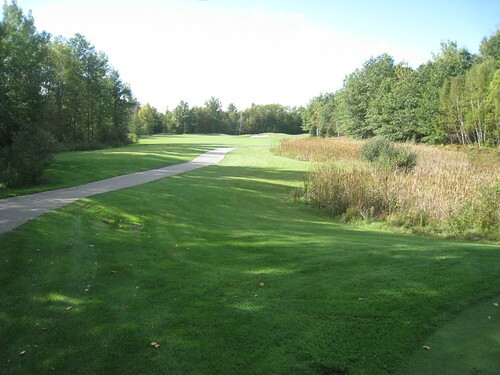 Nine is another relatively short par 4 (390), but that doesn’t make it any less challenging (#3 handicap hole.) OB up the entire left side (with it jutting out into the fairway near the 150 marker) will visually force you to play it a bit right. 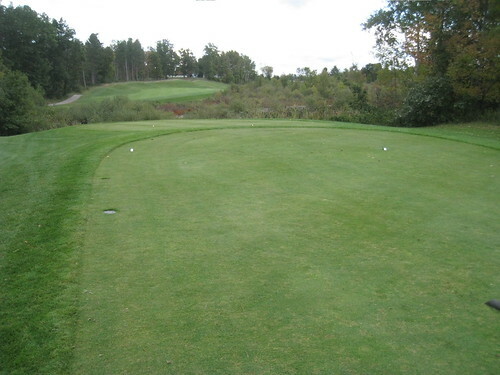 Keep an eye on where your tee shot lands; this hole borders the right side of the driving range, and depending on time of day you may see a number of sliced range balls in this fairway. Looking backwards from the green, you can see just how thin this fairway is, and how far the trouble sticks out. Beware my friend. Starting the back with a bang, the tenth jogs a bit to the right but there’s lots of room, so feel free to take the driver. You should be able to leave yourself with a reasonable approach. 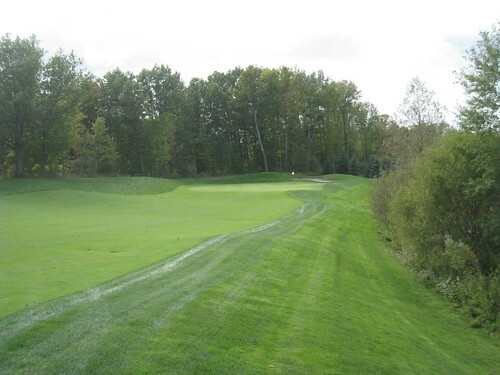 The twelfth used to be a short, challenging par 4 but it’s been converted into a par 3. From the Blues it measures 187, making it a toughie for sure. The real trouble is the water on the left, and the small green. Luckily from the Whites it’s only 149, which is actually perfect for this tee. 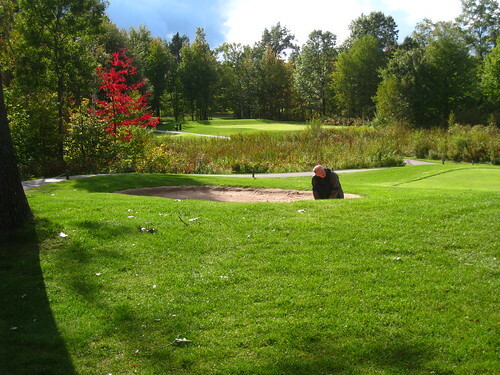 This hole is extremely challenging for the better player, yet reachable and a potential par for the beginner. Love that this is a par 3 now. Thirteen is another hole that, like the 7th, has a sort of “island” fairway. 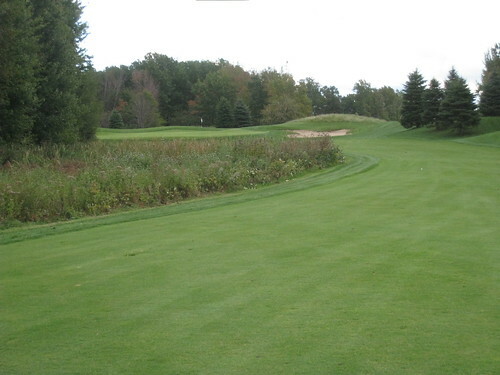 There are forced carries on your tee shot as well as your approach here. I’d suggest an iron or possibly a hybrid off the tee but distance isn’t the only concern. Try to land it near the middle of the fairway as it starts to slope downward, which could leave you a very tricky lie for your approach. I hit 5-iron and was very happy with the results. 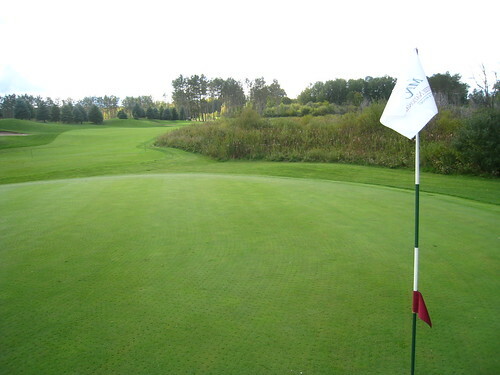 The green is wide and thin so if you dial in the distance, you’re almost guaranteed to be on the green. 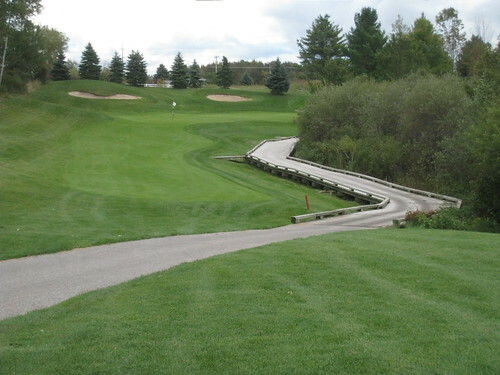 It’s a bit tricky, but with a good tee shot a par is attainable for sure. Sixteen is one of my favorite holes because with a good tee shot, this par 5 is definitely reachable. Measuring 468 and the entire hole playing downhill, distance isn’t the issue here; it’s accuracy. There’s a reasonably fat fairway, so aim it right up the middle and let her rip. Seventeen is almost a mirror of the ninth with the trouble up the left side, and jutting out as you get closer to the green. 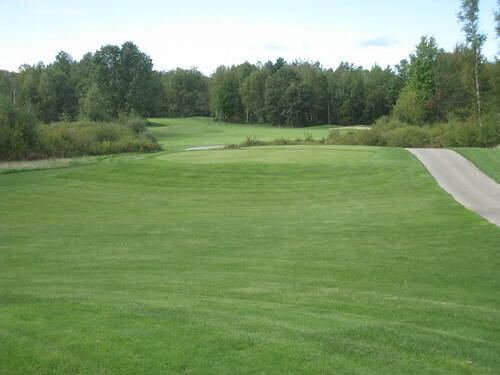 Your tee shot is going to be key here. It is 50 yards longer than the ninth so driver isn’t out of the question, but there’s lots of trouble on both sides. 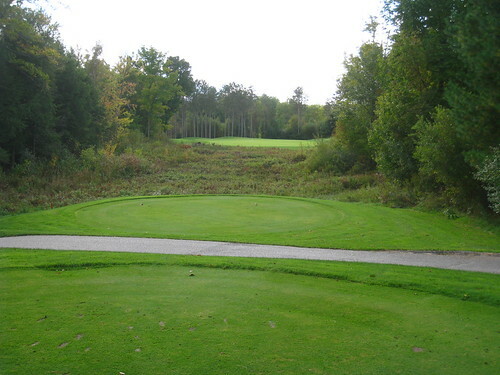 This hole makes for a wonderful beginning to the finish of the round, especially if there’s a wager; great design! 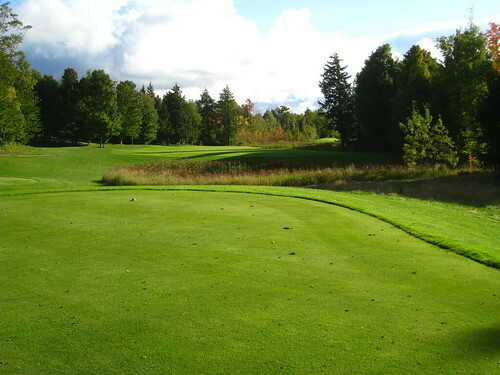 A perfectly struck tee shot should leave you with a view of the green like this. Don’t be afraid to be a bit right of this as well. The eighteenth is a strong finishing hole (even stronger than the seventeenth). The tee shot is crucial; OB on the entire right side and a l-r sloping fairway that ends right about where a perfectly struck tee shot will. 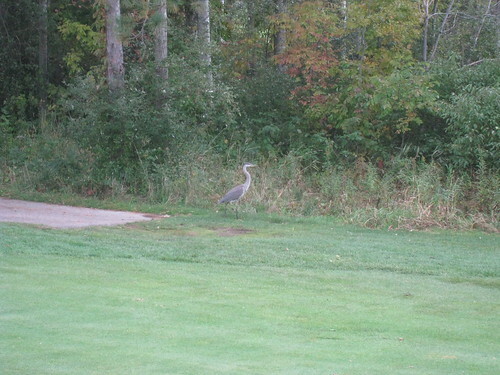 This could be the toughest shot on the golf course. The approach is to the trickiest green on the course as well. Be sure to see where the pin is and club accordingly, as there’s little room for error. There’s a huge spine in this green, and being on the wrong side guarantees (for me) a three putt. As we finished we noticed that the apples were just falling off the trees. 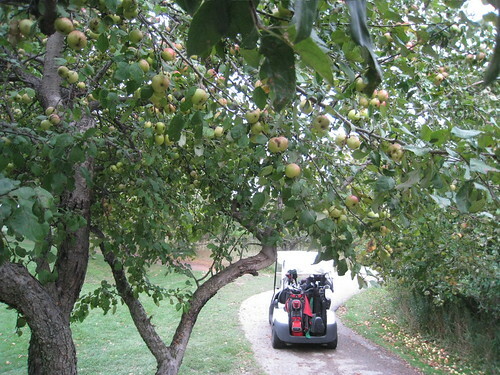 There are a number of spots on the course with apple trees, but the 18th green has one large one adjacent to it that was in full bloom. 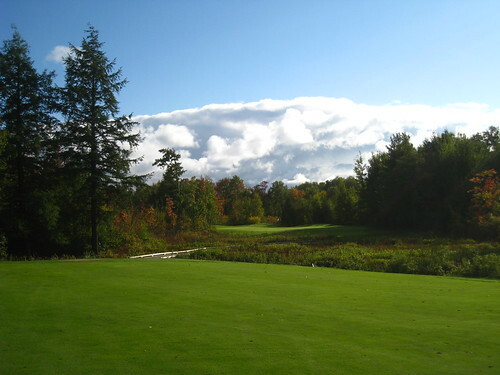 There is nothing better than golfing in Northern Michigan in the fall, and when you add a round with my Dad and great weather, it couldn’t have been better. It’s a round of golf I won’t soon forget.